The video above is not a Sierra Nevada commercial, it is a review by Otis Huff for ConceptLS. THIS IS NOT AVAILABLE FOR iOS7!!!!! It requires Cydgets, which if you open cydia you will see cydgets is not updated! Concept LS (For lack of better name), is my newest creation. I believe it represents a futuristic lockscreen design. That is, when compared to iOS7. Includes features such as weather, time, extended desc, access to your favorite apps,wallpaper chooser, light/dark setting, and uisounds. All in a nice 1.1mb package. Lets talk more about, what makes Concept LS stand out from other lockscreens. 1. Wallpaper Chooser - Allows you direct access to your camera roll from the current lockscreen. You can choose any image you have, and it will set it, as your wallpaper. This happens instantaneously without requiring a respring. 2. Dynamic Blur - iOS7 really has me loving the navigation bars in apps. The transparency, with the blur behind it makes objects, toolbars, navbars, seem to be more part of the application. With a standard solid or even just semi trans image you still do not get the pop of the scaled blur behind it. If you put text on a semi transparent solid then forget about it. Hardly readable, but if you take the image behind it. Scale it, then blur it. You have a nice surface to add to your semitransparent layer. This is what i've added to all menus in Concept LS. It will take any wallpaper you set, configure it to each menu, blur it, and scale it just a touch. Concept LS. Set the weather, celsius, and 24hr all from the lockscreen. Using the standard iPhone keyboard to enter info as well. 4. Access to apps - As of now you have access to 10 apps on the lockscreen. Using an android style unlocking system. You swipe left on the lockscreen, to be presented to your unlocker. You grab your unlocker and move it to the app you want to open. This will open the app. (Faster than when opening from the springboard). You can change each of the 3 buttons by a taphold on the icon. This will bring up the icons to choose from. While this menu is showing, swipe up to switch menus, down to visit previous. Thats 4 good reasons you should try ConceptLS. I could go on about load times, size of files ect but I think that just turns to bragging:) I know you see a lot of packages from me, don't let this one slip by. Definitely a one of a kind lockscreen, that will refresh any iOS6 device. In Closing. I want to thank everyone who purchased 1nspire. Really helped me out last month. 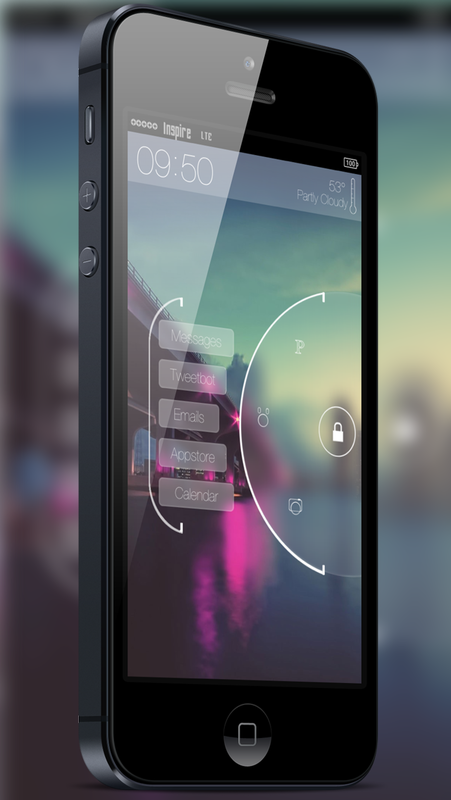 For this I will make Concept LS a free package for anyone who purchased 1nspire. Just shoot me an email, or download when available in cydia. Thanks for helping me be successful at what I love to do! If you liked this please share with the world.